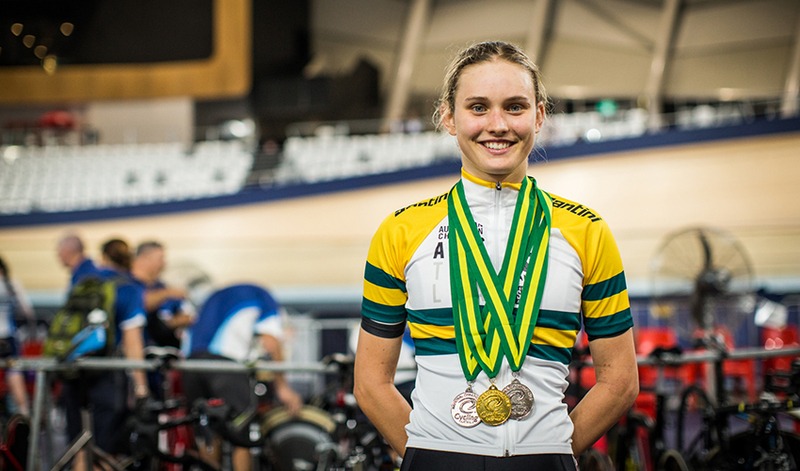 Alexadra Martin-Wallace stole the show on the opening day of the 2018 Australian Track National Championships winning three medals from three events including the under 19 women's scratch race. "I'm really happy! It has all turned out really well," a still smiling Martin-Wallace said following her third podium appearance of the day. The short day one saw Martin-Wallace on track no less than five times, with qualifying and the finals of the team pursuit and team sprint as well as the scratch race. A new look team pursuit line-up of Martin-Wallace, Kristina Clonan, Katrin Garfoot and Laurelea Moss pushed defending champions South Australia all the way to the line as they collected bronze in what was the first time they had raced together. "Started off the day with the team pursuit and to get second being our first ride I am just so happy with that. Then team sprint that was also great with Emma [Green] she is a under 19 and then to get the win in the scratch I am just really stoked overall." With two silver medals to her name Martin-Wallace started the under 19 women's scratch race a marked rider, having won silver a year ago as well as bronze at the UCI Junior Track World Championships. Heading in to the final lap Olivia Wheeler held a near 50 metre advantage with the bunch looking towards Martin-Wallace to close it down. As the bell sounded Martin-Wallace kicked unleashing her trademark acceleration quickly closing the gap and storming to the line. "I looked at the gap and through it is a big gap to close and I knew I had to really go for it. I thought if I got it it would be on the line but the rider out front ended up dying so it ended up being a bit safer than I thought. "It is great I had it in my head I wanted to go one better so really happy to be able to get it and that it went to plan. "Had my teammate Emma Green out there who did so much work for me so I am really grateful to her," Martin-Wallace added quickly thanking her teammate for the support. Even with three medals to her name there is no rest for the 17-year-old as she lines up on Friday to defend her individual pursuit title. "I would like to defend the gold and try and do a PB time. I'll just have to see how I go on the day and hopefully I can recover. 2:24 is what I did last year so a 2:23 would be great."